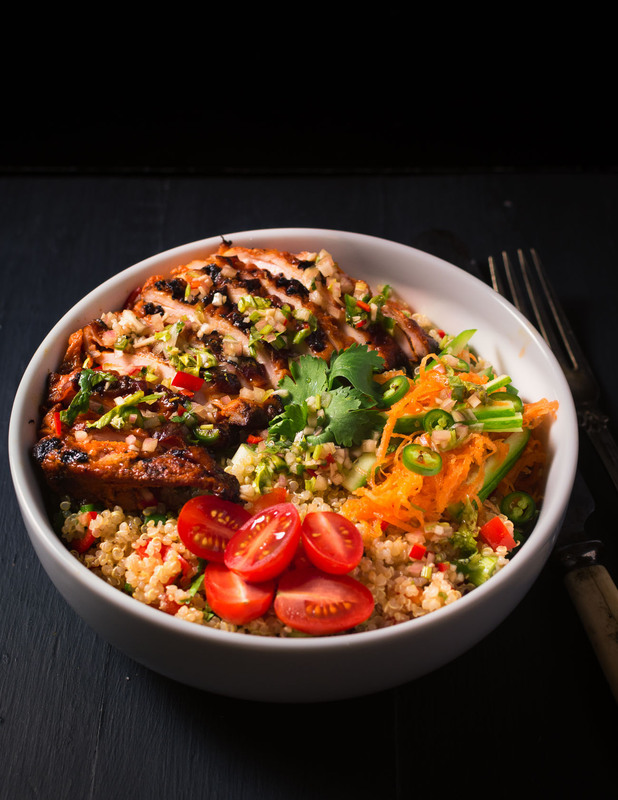 This Thai chicken buddha bowl makes a great weeknight dinner. Or you can grill the chicken ahead and serve it cold. Makes a great lunch. The spicy miso grilled chicken adds a bit of Korean spice to the mix. The bright Thai flavours from the sauce bring it all together. It’s well balanced. Sweet, salty, spicy, sour. All the southeast Asian flavours are represented. It’s just tasty. This is a nice weeknight dinner. Perfect any time but really good on those hot summer nights. The miso chicken has a Japanese meets Korean thing going on. More like Japanese slams into Korean maybe. But miso and gochujang work really well together. It’s worth trying that on it’s own some time. The real star here is the Thai dipping sauce. Once you try it you will use it. A lot. I do. It’s a regular staple in my fridge. Cheating almost. Put it on anything. It just works. It’s awesome with grilled chicken. Or on steak. Like Thai chimichurri sauce. Dip for chicken wings. Sauce for fish. In a Thai meets Vietnam banh mi sandwich. Getting the picture? It’s seriously addictive stuff. Take this recipe as a guideline. Inspiration to do your own thing. This isn’t a buddha bowl edict. I’m not the buddha bowl police. It’s a free country. Make it your own. This Thai chicken buddha bowl is a simple recipe that you can take and make your own. Have some fun with it. Doesn’t even have to be a chicken bowl. You can substitute anything grilled. Shrimp, pork or even beef. Go with the quinoa. Maybe try rice noodles instead. Or even rice. It’s up to you. The only constant is the Thai dipping sauce. 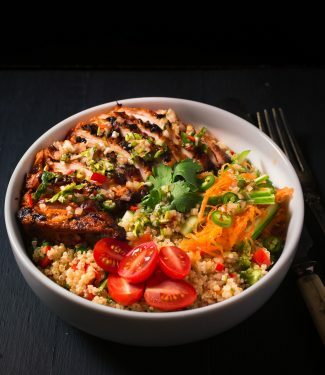 The sauce makes this Thai chicken buddha bowl. Or shrimp bowl. Or beef bowl. Run with it. You won’t be disappointed. Or make it as written. It’s really good that way too. 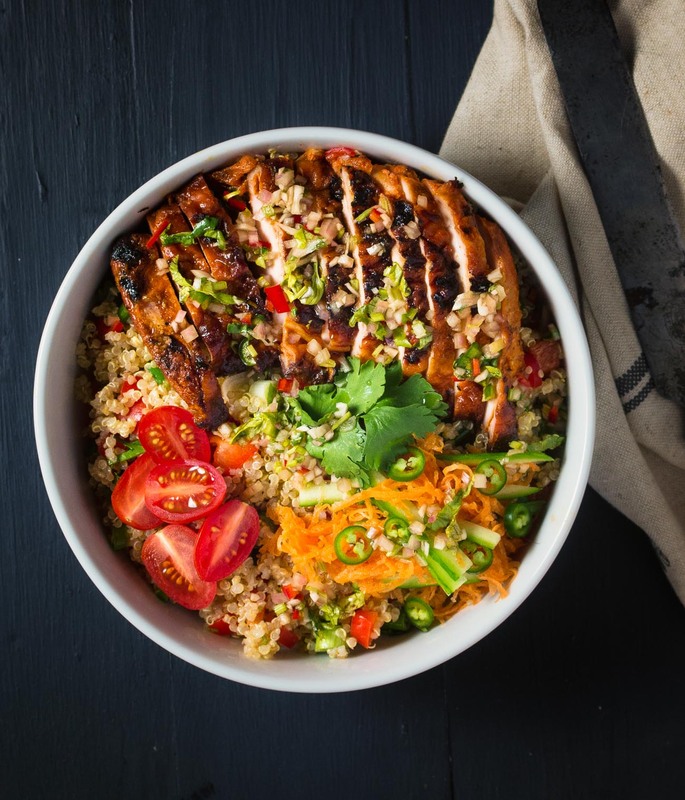 This simple Thai buddha bowl explodes with asian flavours and healthy quinoa. Make it for dinner or make it ahead for a really good lunch. Bring the chicken stock to a boil. Add salt and quinoa. Cover and cook for 12-15 minutes or until quinoa has fully absorbed the chicken stock. Cool the quinoa and toss with the red pepper, green onion and red chili. Add enough vegetable oil to moisten, around 2-3 Tbsp. 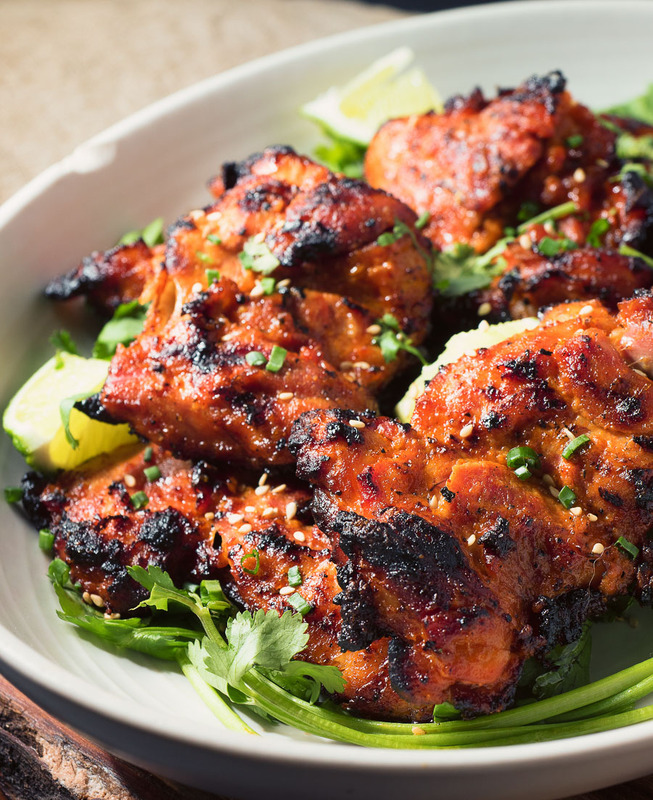 Make the spicy miso grilled chicken and Thai dipping sauce. Spoon quinoa salad into the bowl. Top with chicken and garnishes and drizzle with Thai dipping sauce to taste. The recipe for spicy miso chicken can be found here. Make it on it's own some time.. That works really well too. The recipe for Thai dipping sauce can be found here. It's just crazy good on anything so make lots. In bbq and grilling, main course, poultry, salad, thai. Bookmark the permalink. Romain, the link to the miso chicken recipe is broken. I want to try making this. Could you please check? Fixed now. Thanks for the heads up Megan! I made this chicken on the grill minus the chilis. It was the best chicken I ever made. Thanks for this recipe. My other half requests this all the time now. Big hit! That’s great to hear. If you have any of the Thai dipping sauce try the Thai roast chicken or grill some chicken wings and toss them with the sauce.